Do You Apply Learning Theories to Your Online Course? Emerging technology is changing almost every aspect of our lives. As a result, we should not be surprised that new technology has an impact on how people learn. The development of online learning has rapidly increased through the advancement of technology. Indeed, technology is a powerful tool for instruction—it helps students actively engage in class activities, collaborate with their peers, and develop critical thinking and problem-solving skills. Of course, technology can also save time and money by delivering online instruction anytime and anywhere. Therefore, we cannot ignore the use of technology that can create many instructional strategies and activities. However, technology is a tool for instruction. Whether or not we use technology in instruction, sound learning theories such as constructivism and Vygotsky’s social cognition should be embedded in online learning to facilitate effective learning and teaching. Garrison and Vaughan (2008) assert that, in the constructivist environment, students can be self-directed—experiencing what they have learned in class and reflecting it on their own thinking by personally exploring questions and ideas in their learning tasks. They also mention that, in this learning environment, they can actively construct knowledge through a collaborative inquiry process with their instructors and peers—testing, reaffirming, and reexamining the instructional information in a community of learners. In addition, Vygotsky (1978) asserts that collaborative activities are a means to promote knowledge construction. Peer-to-peer interaction is important in investigating and developing multiple perspectives of learners. Learners can support and challenge one another to construct meaning and establish shared instructional goals. Effective learning environments consider student-centered learning. Students are able to control the instruction to their own learning styles and choose learning activities that are most appropriate for them. Students learn most effectively when they control the sequence and pace of their own learning. In addition, students bring their unique backgrounds and experiences to the learning context, and thus cultural diversity should be rewarded in class. Accordingly, online courses should be flexible and create environments that enable greater choice for students in order to accommodate individual learning preferences and cultural perspectives. Online learning environments enable students complete their instructional activities in a classroom, from home, or in the workplace, based on their own schedules. They can also interact with their instructor and classmates in real time. If they cannot attend a scheduled synchronous class meeting, the session is typically recorded so that students can review it at a time that is more convenient for them. They can also choose appropriate learning materials and activities, based on their own preferences, from among diverse online resources and a variety of instructional multimedia. Reflective thinking and collaboration are critical factors in constructing meaning in the learning and teaching process (Garrison & Vayghan, 2008). Students learn most effectively when they are actively engaged, their prior experiences are valued, learning events are personally relevant, and critical thinking skills are promoted. Accordingly, online courses should promote critical thinking through collaborative work and self-direction. Students in the online learning environment can use asynchronous written communication and assignments to have more time for thoughtful reflection and participation. Students can learn only when their knowledge is challenged and supported through their interaction with peers (Vygotsky, 1978). Students learn best when their knowledge is challenged and supported through their interaction with peers. Embracing diverse ideas and the use of multiple perspectives in the classroom help students develop cognitive learning skills and increase critical interpersonal skills. Accordingly, online courses should provide a climate of trust and open communication to support peer-to-peer interaction. In the online learning environment, students can explore content while communicating with their instructor, peers, and experts—either synchronously or asynchronously—in order to share their experiences and ideas and better understand the instruction. Assessment-centered learning is also critical for effective knowledge construction. Assessment involves both formative assessment and summative evaluation. Ongoing formative assessment allows us to diagnose students’ misunderstandings and misconceptions, identify students’ diverse needs, and monitor and track their progress during the learning process. Summative evaluation allows us to assess learner performance, judge learning achievement, and determine the effectiveness of learning at the end of the instruction. Accordingly, online courses should provide instructional strategies that give constructive feedback in a timely manner. They should also include collaborative assessment activities that are based on peer reviews and, at the same time, student self-assessment to reflect their own work (Garrison & Vayghan, 2008). Students in the online learning environment can monitor their learning progress through automated assessments of active learning and receive their grades and instructor feedback through a learning management system. Technologies, when integrated properly into learning environments, efficiently and effectively facilitate learning and teaching. Not surprisingly, technology plays a vital role in online courses. Learning management systems are used to automate administrative functions such as course enrollment, monitoring, progress, and assessment. In addition, online courses require technological resources such as network services, computers, software and online learning materials, and online communication tools for instruction. Accordingly, online courses should provide consistent, reliable technical support to ensure that all technology used is accessible and usable for efficient instruction. Vygotskly (1978) emphasizes the importance of guided activities. He points out that an instructor plays a critical role as a guide and facilitator to construct students’ knowledge effectively. An online instructor needs to provide immediate and consistent feedback, create a sense of engagement, and motivate group collaboration. The instructor’s function is a particularly important in online courses, since electronic communication requires individual consultation and consumes a great deal of both instructor and student time in order to clarify and solve problems. Ideally, the online instructor should be responsible for these interactions, personally answering every inquiry, comment, or discussion with immediate feedback, while ensuring equal participation of learners in online courses for effective instruction. In summary, today’s technology allows us to enhance learning, support effective instruction, and engage students. There is no doubt that technology is an integral component of online learning. However, technology should be considered a tool for instruction—a tool that cannot enhance learning and teaching based simply on its own merits. There is a danger in making hasty decisions about online courses that fail to include well-developed learning theories. We should always keep in mind that sound learning theories should be embedded in online instruction as a best practice for facilitating effective learning and teaching. Garrison, R., & Vayghan, N. (2008). 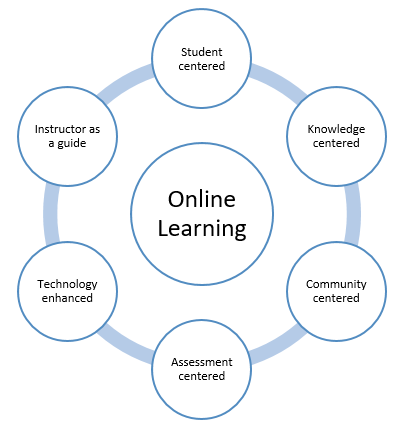 Blended learning in higher education: Framework, principles, and guidelines. San Francisco, CA: Jossey-Bass. Younghee Jessie Kong is the instructional design faculty of International Institute for Innovate Instruction and professor for the M.S.